I've started a painting in the studio of "The Lobster Shack". It was a great find. I've got both watercolor and oil studies as well as lots of digital pix. I found the camera can't pick up the colors I thought were there. Maybe I haven't set up the camera right or maybe I see more nuances than the camera. Probably both. The studio painting is going fast because I 'have a plan'. I'm particularly interested in the painting as a finished product. So much different than plein air where I never get it completely done and don't paint on them afterward. I miss the spontenaity that 'alla prima' painting outdoors accomplishes but I am discovering new techniques and ability to 'see'. Studio painting is dangerous because it is about painting what you know rather than what you see. I hope that the work I have done in Plein Air has built my visual vocabulary suffinciently that I can 'wing' it in the studio. There will probably be a series of these paintings as I've got some things to try. My goal is to have 50 paintings with considerable consistency by next spring so that for the purpose of a resume'. We were at the famous Desert Island where Cole, Fredrick Church, and other artists since the early 1800's have painted. 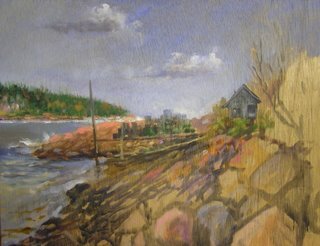 I found a lobsterman's shack, owned by Otter Creek society, in Otter Bay where Church had stood on the opposite shore and painted a scene of Cadillac Mt. I visited this site many times in the next few days. It was on the leeward side of the head and consequently was in shadow most of the day but was out of the wind. We had a storm that put most of the power out in Maine. The waves were fantastic but hard on the eyes. My eyes got bloodshot, probably from the salt as much as anything. The wind blew across the tops of the waves that were coming in diaganolly causing spray to drift as much as a mile inland. I had to hold my easle in one hand as I painted leaning into the wind. I went to the Thrift store and bought extra clothes and finally ended up wearing goggles. I'd never been to the east coast. They say you are the first one to greet the sun hitting the N. American continent from the top of 1500' Cadillac Mt. The first inhabitants were Native American of course. A tribe called Abanake's. Called the place the 'sloping land'. The French found 'Sommes Sound' and harried the British who were supporting the Colonies. Then those that propspered from the Civil War located their summer mansions here until there were 229 mansions that later burned in a 10000 acre fire. Those that cared got around to preserving the place and created the Acadia National Park. The first NP created in the east. All the others were created by congress in the west to guard against the nouveau wealthy from purchasing Yellowstone and Yosemite and loggging them. 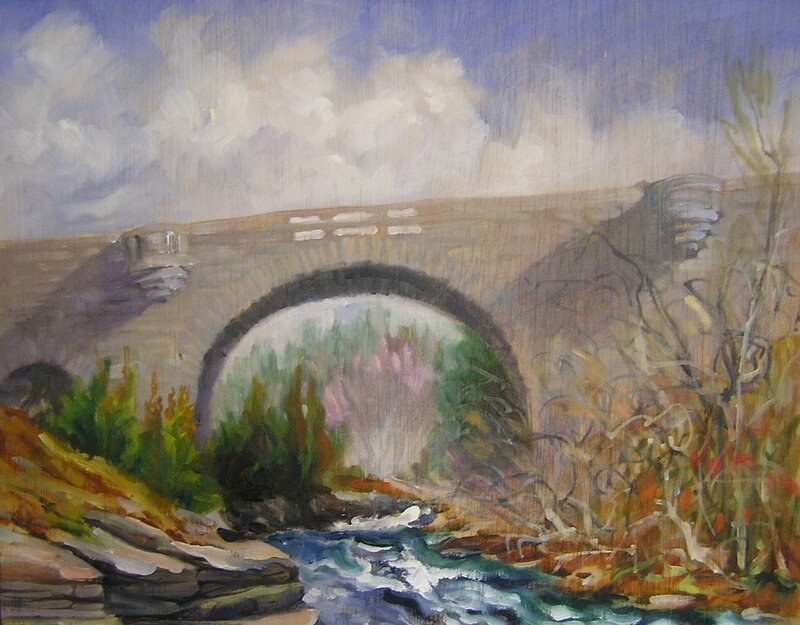 Artists were important in pursuading Congress to make these parks. Thomas Moran Painted such wonerful paintings that the Congress went the distance and not only made the parks but put his painting in the Hall of Statues, elevating the landscape as a national treasure. Not only does nature nuture artists but artists nurture nature. Rockelfellers contributed a lot in real estate and built more than 50 miles of horse drawn carriage roads to guard against intrusion by the automobile and the hordes of NY. Oddly enough the Rockefeller's fortune was from Standard Oil and the auto was to be their fortune. They didn't want to see their Eden spoiled and thought they could mandate carriages only. It worked to a point but had to end when the public got a shot at paradise when it was made a park by Congress. Ol' Teddy Roosevelt, blue nose that he was, had to allow that the only way the place could get on the national registry if John Q Public had a share in it. I have to think that there were some mighty fine rigs with some pretty spiffy horses steaming down the carriage trails, taking in the sights and doing picnics in some pretty awesome scenery. From the sound of it their were some major summers spent by the well healed and their cadre of artists and writers. It must be the earliest American Art Colony. The storm had not yet abated but sitting in the canyon as Duck Brook cascaded under the Bridge was a little better than standing in a full gale on the headlands. Duck Brook drains the Eagle Lake area. It provides water to the community of Bar Harbor. There's an old riveted wrought iron pipe about 14" in diameter that runs off through the oaks and beech from a large water tower filled from the lake. The place was self sustaining if you didn't have to get along on LOBSTER for heaven's sake. Until recently Lobster has been considered the 'hotdog' of the working class. You wouldn't know it today what with the price of a lobster tail in a restaurant fetching $20. We payed $5 lb and a 'chicken' was about 1 1/4 lbs. We ate an estimated 19 soft shell bugs (that's what the 'down easter' Aaron called 'em. Lobster are soft shell just after they molt. Hardshell afterwards. They come into the shallower warm water to molt and then proceed to deeper water while the logstermen chase them out as far as 20 miles. They used to only put out a trap per buoy but now have 'trawls' that set out as many as 50 buoys. A commercial lobsterman may have a permit for 500 traps. Hard dangerous work. In Gloucester (pronounced Gloster) over 5000 fishermen have died. Each of their names are memorialized in City Hall. I found all this out by reading Mark Williams book "FV, Black Sheep". It's a randy tale of how it really is, no holds barred. Good job, "Mahhhk". Winter is here. My plan is to hold up in my new studio and work. I've got tons of plein air paintings and water colors. I noticed today that the digital photos I took don't come close to the color my sketching recorded. I guess the studio paintings will be a happy medium between the two methods. Hope to get back there and maybe drive some horses and do some more sketching.